This reminds us of the famous case known as Plessy vs. Ferguson. 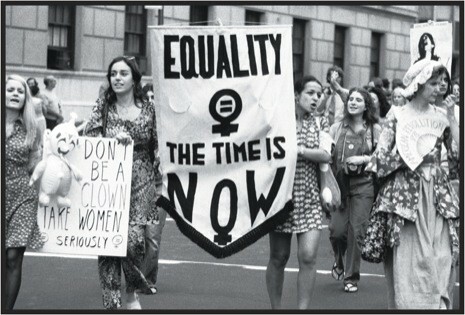 This is a protest that was for equality. This is a photo of the Seneca Falls Convention. 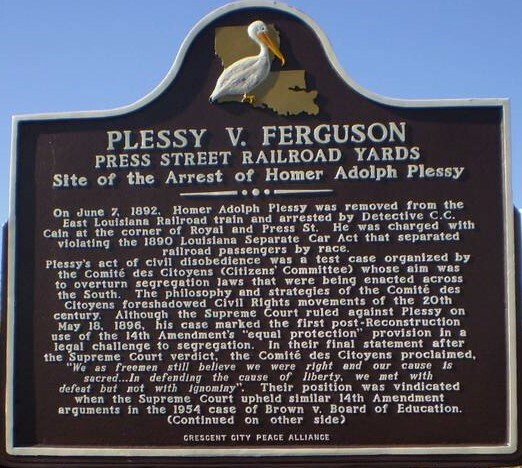 Plessy vs. Ferguson is about a man who was 7 eighths white 1 eighth black that was arrested for being a black in a white train. He sued the state of Alabama for his arrest. 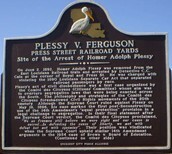 Plessy thought that the arrest was 'unconstitutional.' This case went all the way to the Supreme Court. Ferguson won the court case because the court decided that the 14th Amendment was talking about politics and civil rights only, not social life. From then on Jim Crow laws were legal because of Plessy vs. Ferguson. Have you ever heard of Jim Crow laws? They were laws in the south that kept blacks and whites seperate. Jim Crow laws separated water fountains, buses, schools, restrooms, pools, etc. All blacks HATED Jim Crow laws and some whites because Jim Crow Laws were pure segregation. But now in modern day Jim Crow laws are AGAINST the law. The 19th Amendment gave women the right to vote. It was a bill for 42 years then finally it became a law! It first became a bill in 1878 and it was created by Elizabeth Cady Stanton and was finally a law in 1920. The movement to get women's right to vote was called sufferage. Before the 19th Amendment women's right was a state's vote. The Seneca Falls Convention was a group of over 250 people to help get women's rights. While everyone was there they made a list of 12 things they wanted. This convention started the Temperance Movement. The Temperance Movement was about getting men to stop drinking and it WORKED! In the end, the Seneca Falls Convention started a big leap in women's right.